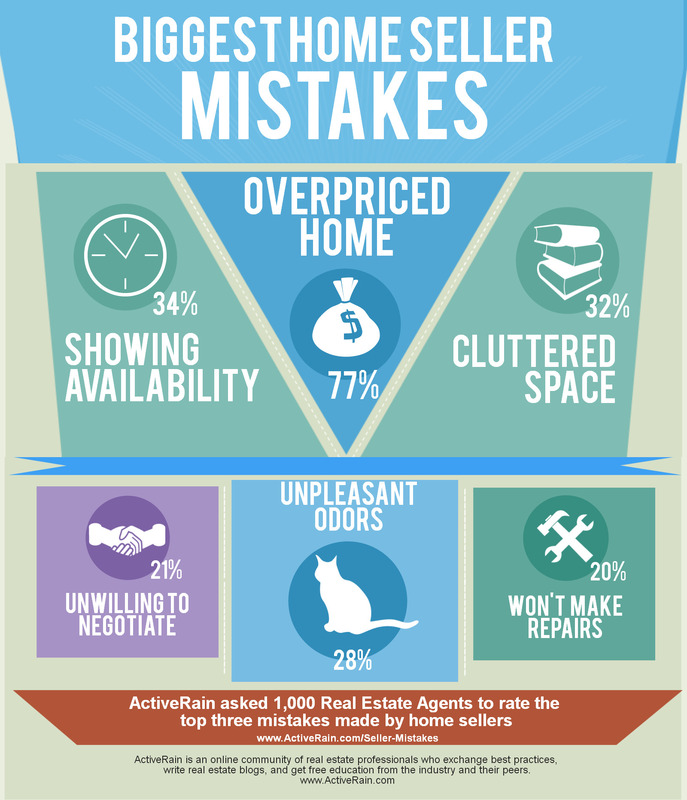 The Biggest Home Seller Mistakes – Some Listings Have It All! Home Seller Mistakes can cost precious time, thousands of dollars, or even the sale! At Maine Home Realty, we represent both Sellers and Buyers in real estate transactions. Often, before we list property for sale, we are asked to make recommendations and suggestions to our Selling Clients about all kinds of things. Our recommendations are based on our knowledge of what Buyers are currently seeking, current market conditions, the condition and location of the property, and the Seller’s resources. When our Seller Clients listen and act on our recommendations, they are taking the first steps toward the closing table. Earlier this year, the Active Rain community, one of the largest online real estate forums, conducted a survey of its membership to determine what real estate agents feel are the Biggest Home Seller Mistakes. From all over the country, the responses were compiled – you can see the results in this nifty info-graphic. One of the most dismaying experiences I’ve ever had while viewing homes with a Buyer involved, potentially, every single one of these Seller mistakes! Several years ago, I was working with a First-Time Home Buyer Client. There wasn’t much in his price range so we looked at everything on the market that fit his criteria, and most of it wasn’t pretty. But one house had it all – ALL of the Biggest Seller Mistakes, that is! The listing agent advised: There is a friendly dog in the house, “Just ignore him,” and the key is for the back door. So, we entered the house through the back door and were greeted by a cluttered, dirty-dish-laden, trash-can-overflowing, kitchen. Passing into what should have been a dining room, we encountered a large, screeching bird in a cage with a sign that said “I bite.” He was messy, too! Plenty of seed and shredded newspaper was scattered about the floor. There was also a large, fluffy cat roaming about that, surprisingly and thankfully, ignored the screaming bird. But it was impossible for us to ignore the unpleasant odor coming from the overflowing litter box in the bathroom. And then it got really weird – we could go no further in viewing the rest of the home. Right at the bottom of the living room stairs, there was a beat-up, over-stuffed chair (it was actually blocking the front door – I guess that’s why we came in through the back! ), and upon that chair sat an old, smelly, Basset Hound that barked and bayed and wouldn’t let us past the chair to go upstairs. Really? Yes, really, you can’t make this stuff up! This house had all the top Seller Mistakes – It lacked showing availability (at least in viewing the 2nd floor), it had a plethora of clutter and unpleasant odors, and needed repairs were as obvious as the need for a good thorough cleaning! Given its condition, the home was definitely over-priced. I don’t know if the Seller would have been unwilling to negotiate or make repairs because my Buyer Client certainly wasn’t going to make an offer. Between the screaming bird, the bad smells and the howling Basset Hound, we couldn’t wait to get out of there! Hire Maine Home Realty to market your home for sale and contact us early in the process to get our professional recommendations and avoid the Biggest Home Seller Mistakes! This entry was posted in Home Seller Mistakes, Maine Home Realty Services, Seller Info and tagged Active Rain, Biggest Home Seller Mistakes, Real Estate Services, Selling your Maine Home. Bookmark the permalink.